April | 2014 | I run. Quite a lot. It makes me happy. I’m trying to write something every week, but not if there is nothing to write about. This week I haven’t been out much. I’m getting ready for the 3 Forts Challenge next weekend and my back and calf are a little sore, so I’ve been planting a few veg in the garden this weekend as well as spending a lot of time on the sofa watching football and cricket. The same can’t be said for Nick though. In light of her exploits today, let’s recap the last couple of years for her. 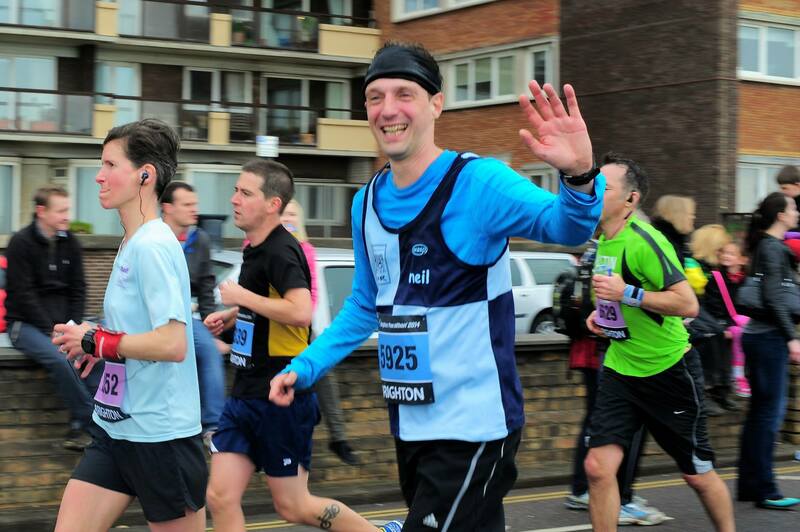 When we lived in Brighton Nick dabbled with running. 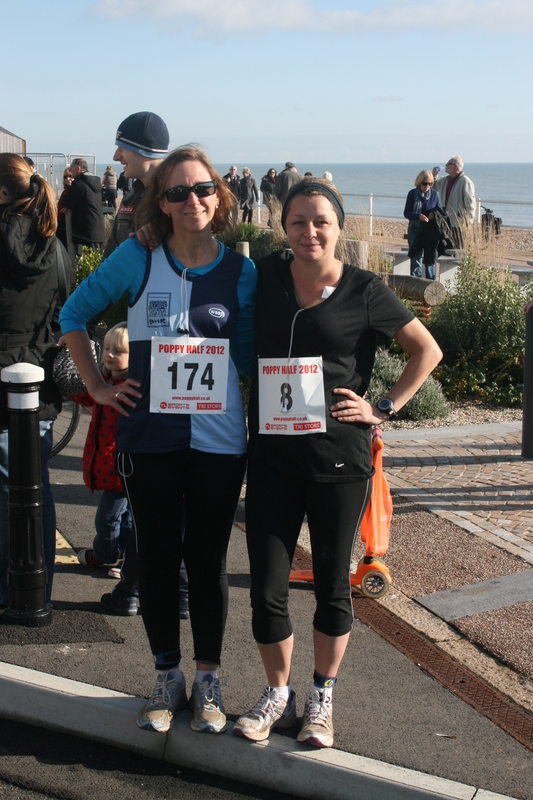 We spent some time on the prom jog/walking and she spent a little time with the Brighton and Hove Running Sisters. It never really took off for some reason and I was the only Dawson who really did any running. The move north of the South Downs made a huge difference to our lives, I joined BHR and Nick decided to get fit while between jobs. The redundancy from Sussex Enterprise changed our lives in a very positive way. Once she had overcome the fear of ‘does my bum look big in this?’ and ‘I don’t want to go out running in daylight as people will look at me’, she hasn’t looked back. The last 30 months are testament to what you can do if you put your mind to it. 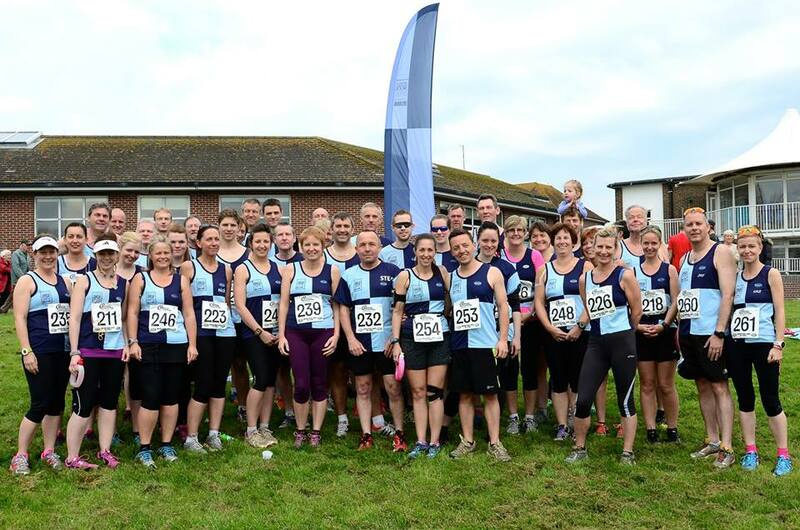 The first stage was the Downlands Dash, organised by BHR, but this was before Nick joined the running club and I remember it being a big deal at that stage. 5 miles is a long first race. 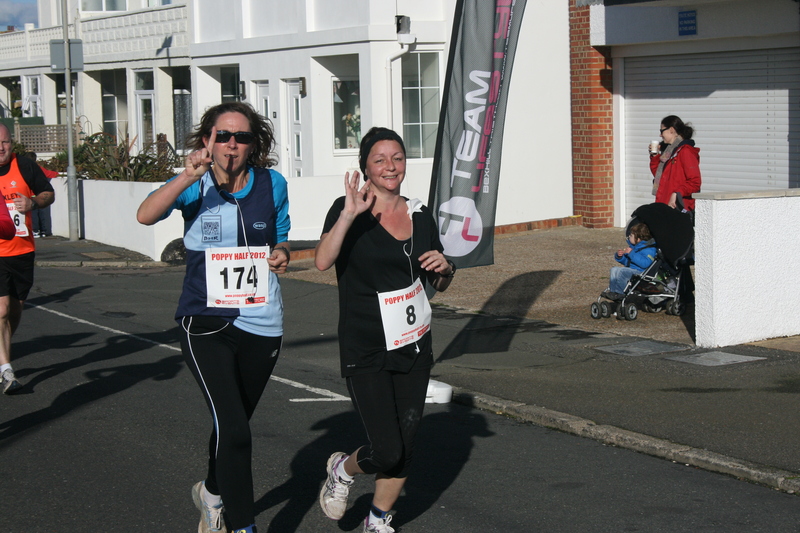 The first event that we did together was the Hellingly 10k in 2012. It was a really hot day and I remember that there was a big hill in the middle. I came home in around 56 minutes and was expecting to wait a while for Nick to arrive, but she came home in an hour and 2 minutes. I think that this was very impressive and at that stage totally unexpected. 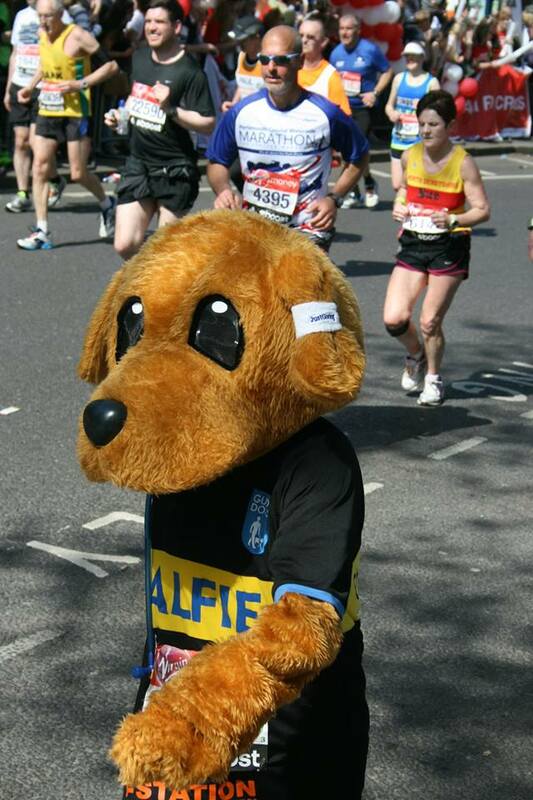 Things moved on and the next stage was to join the BHR, do a half marathon and enter the Brighton Marathon. Joining BHR was a great thing for Nick. It supplied her with the encouragement and the companionship to push her forward. It’s great to have peope to do the long runs with you. 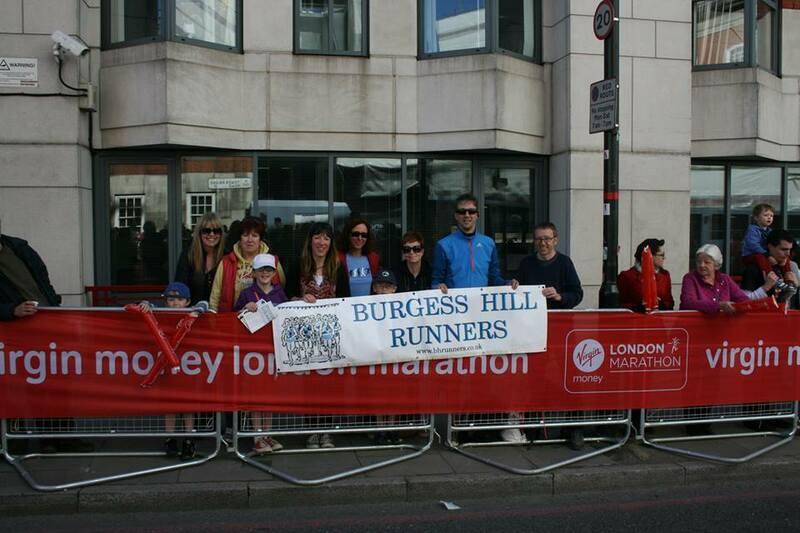 And below is the photo of the BHR tutu girls and Steve after the Beachy Head marathon. 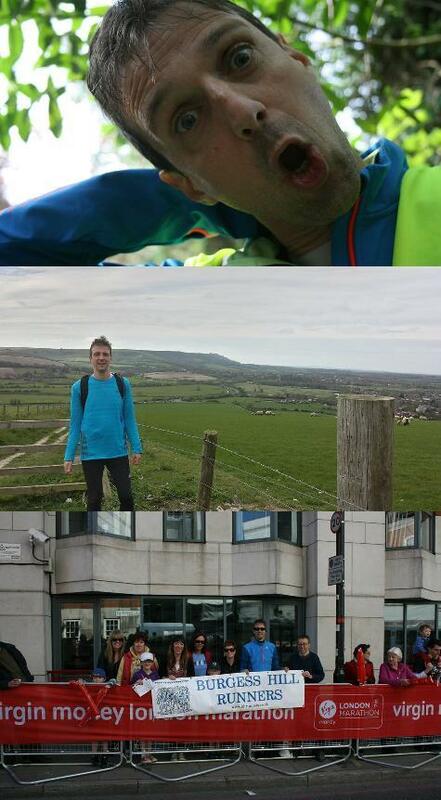 The 2 photos below are Nick and Caroline at the Poppy Half in November 2012, getting ready for the Brighton Marathon in 2013. I remember during the training for the Brighton Marathon that Nick would go out in all weathers, even getting lost on one occasion in the sleet and freezing cold. 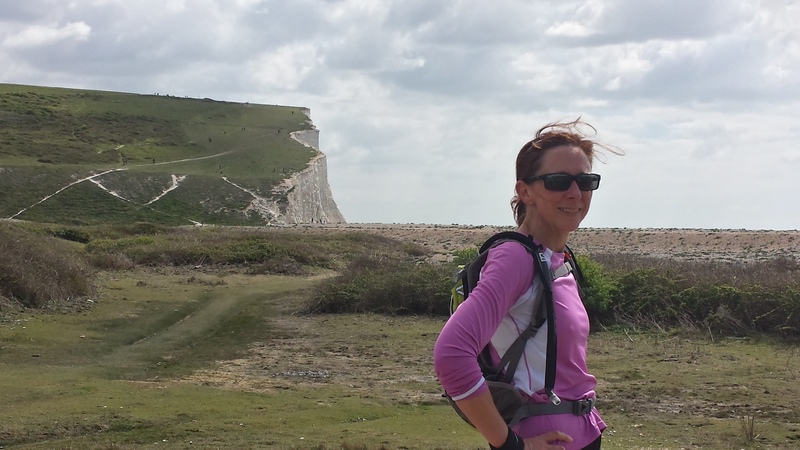 Anyway, so things moved on, a lot of hard work was put in and 2013 saw her complete the marathons and Brighton and at Beachy Head. 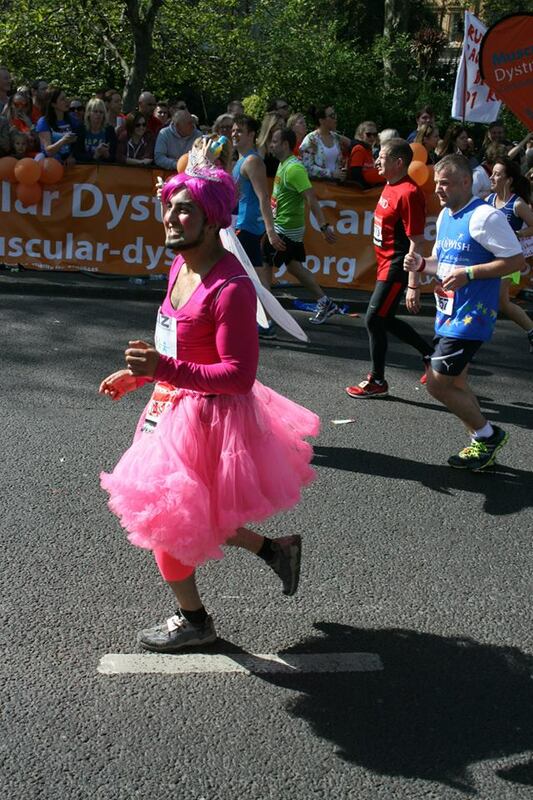 Having completed the Brighton Marathon again in 2014 and having crewed for me at the Dark Star Marathon, Nick soon started the mention the word ‘ultra’. She meant it as well. It didn’t happen as she’d expected though. 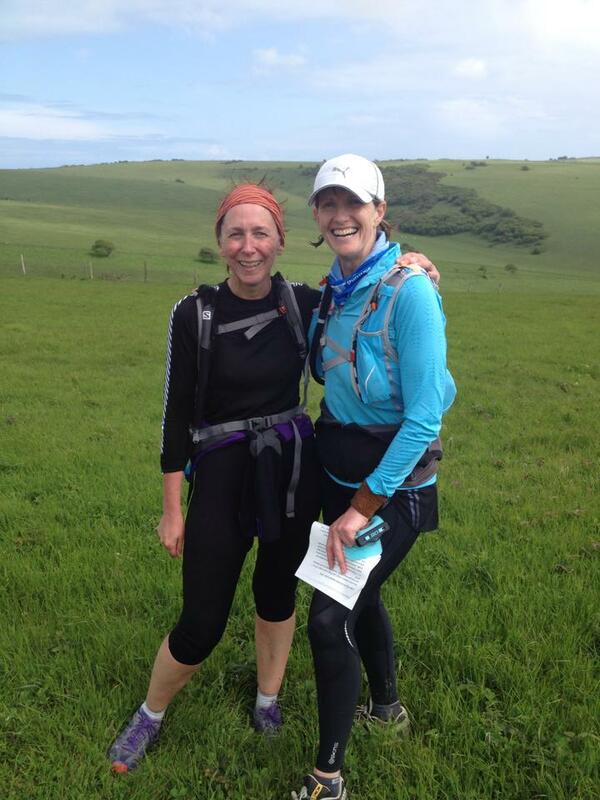 This Sunday, she completed the Long Distance Walkers Association 28 mile event over some ridiculous hills. It was slightly sprung upon her, so she had little time to worry or get nervous and had the pleasure of running it with BHR long distance legend Jan Lavis. As you can see – some serious ups and downs (the hills are the green section at the bottom). So, there you go. A very brief story of non-runner to ultra-runner in around 2 and a half years. Why did I want to write about this? Well, I have received huge amounts of support from many people over the past few years and so has Nick. If writing about what Nick has done inspires and encourages someone else to give it a go, then it’s worth every second it took to write. There’s a lot of people out there who think that they can’t. They can and this proves it. That’s it for this week. Well done Nick, so incredibly proud of you. I’m hoping my back feels better for next Sunday and the 3 Forts Challenge. Well this weekend I entered the Downslink Ultra. 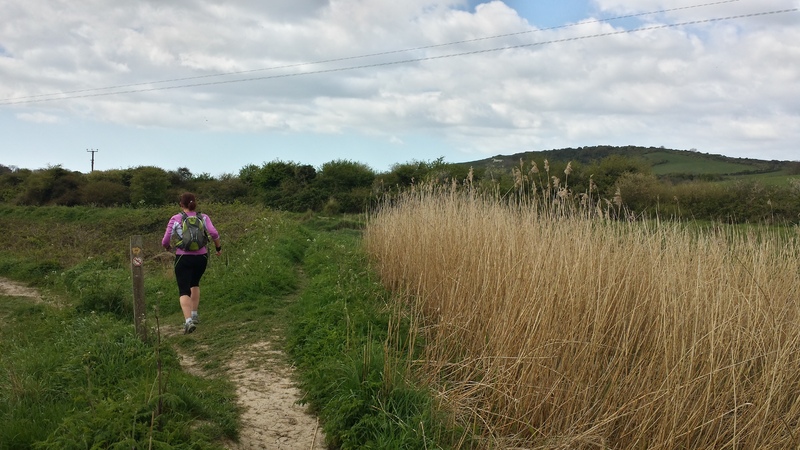 It is a 38 mile race from St Marthas Hill, Surrey to Shoreham- by-Sea, West Sussex using the Downs Link footpath and bridleway. It’s not a big step, it’s a huge leap. This time last year I didn’t think I would even do another marathon, so this is a real surprise. If I don’t do it now, I’m never going to do it. There are going to be a lot of things to learn over the next 5 months, and a lot of miles to put in. We spectated at the event last year. In fact Nick was an excellent spectator. If she doesn’t decide to run it, then the beer may have to wait until the end this year, as I may well need a crew. There are a couple more events that I want to enter this year, but they will have to wait until after pay day. 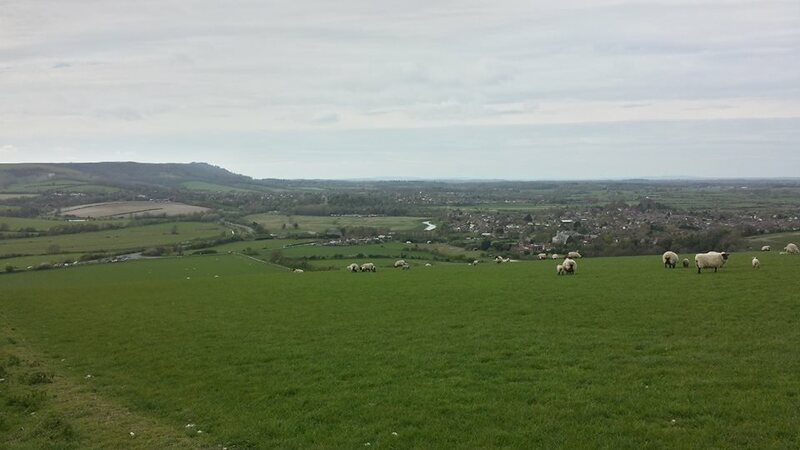 It was Easter this weekend, so after spending Thursday night on preparations for the Green Belt Relay, we headed out on Friday morning to Alfriston and a section of the South Downs Way that I haven’t seen before. There are a couple of car parks in Alfriston and from there you can head off in several directions. 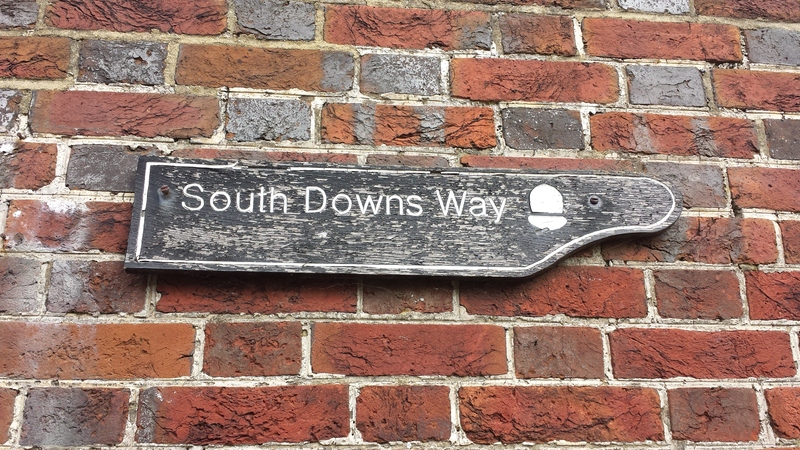 We headed into the village centre and found the SDW sign. 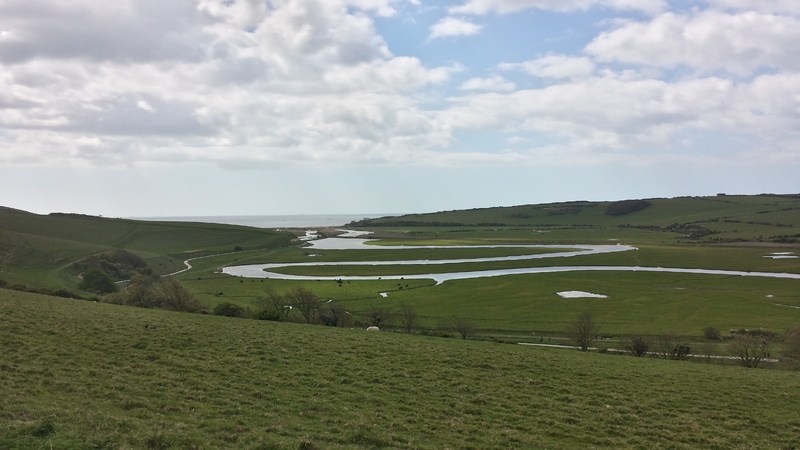 For about 2km, it is as flat as a pancake along the banks of the river Cuckmere. 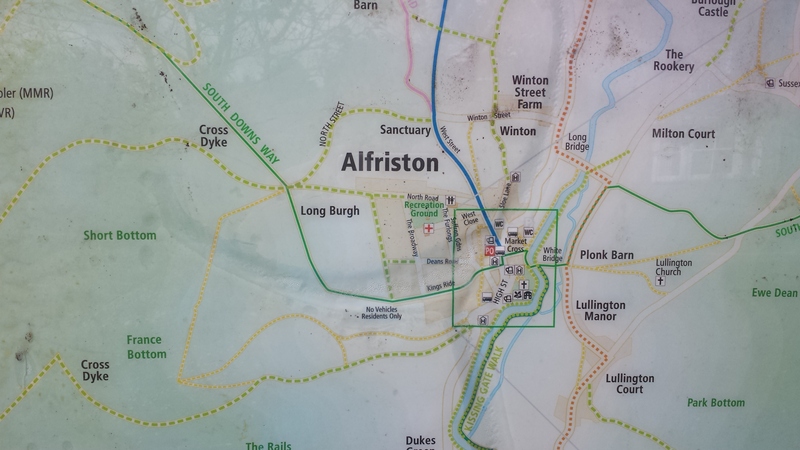 You then climb through Litlington village on road to start with, then off road. 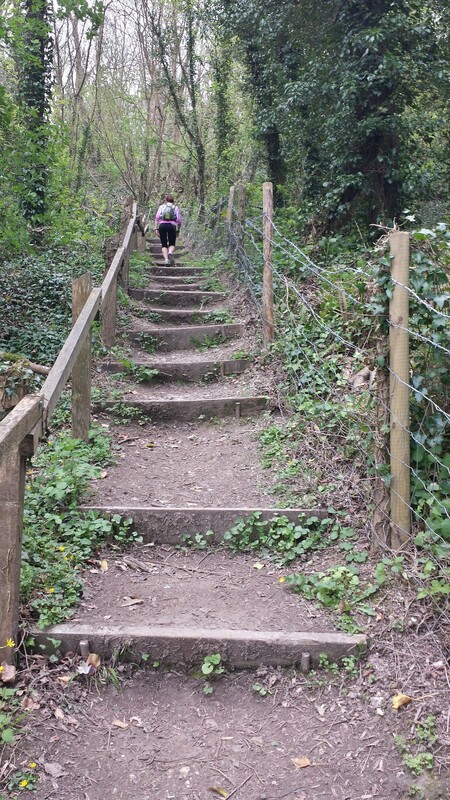 The climb lasts for about 5 minutes as we had to walk some of it and it is followed by a sharp descent into Friston Forest. At 3.5km you meet the first set of steps. 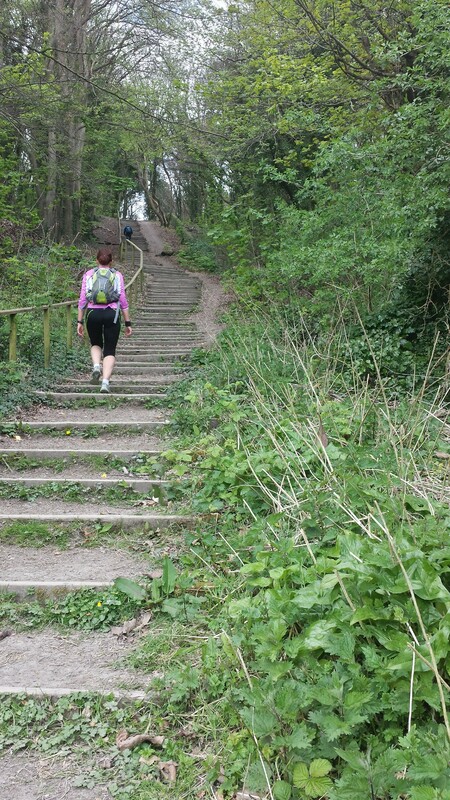 After these steps, you head through Friston Forest and find yourself faced with another set of steps, only this time quite a lot longer. Climbing these steps is definitely well worth the work. You have to walk them, unless you’re not built like the average person. This is what you see. From here we crossed the road and followed the meander of the river down to the beach, where we turned round and headed back from where we came. It’s not a long run. It’s around 14km, just under 9 miles. 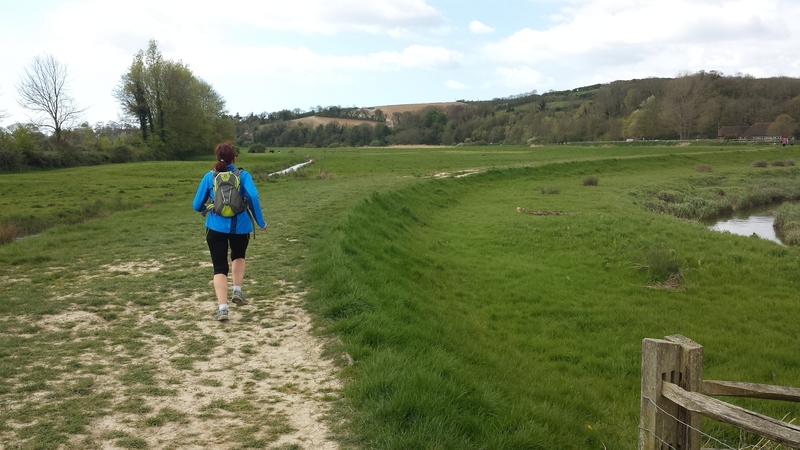 However, there are plenty of paths in Friston Forest where you can add extra distance to the run. It is wonderful though and sums up the SDW perfectly for me. 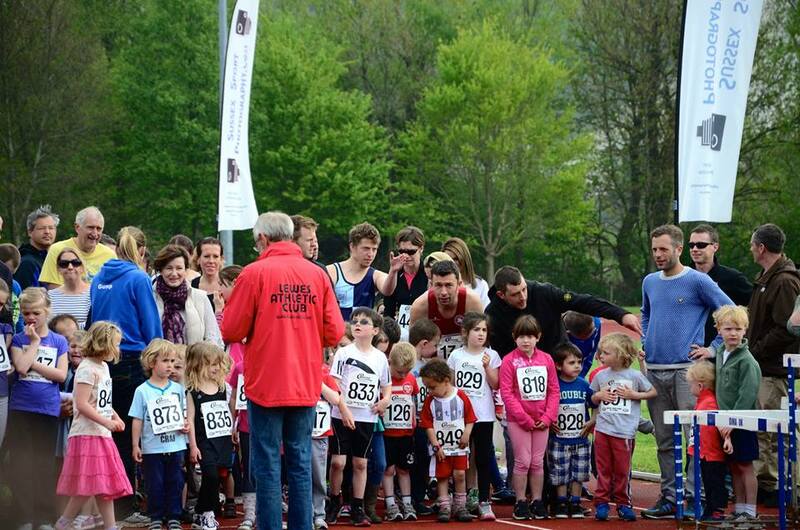 Easter Monday always sees the Lewes 10k. This is one of my favourite events even though I always find the run itself pretty tough. The race has it’s centre at the Lewes track. 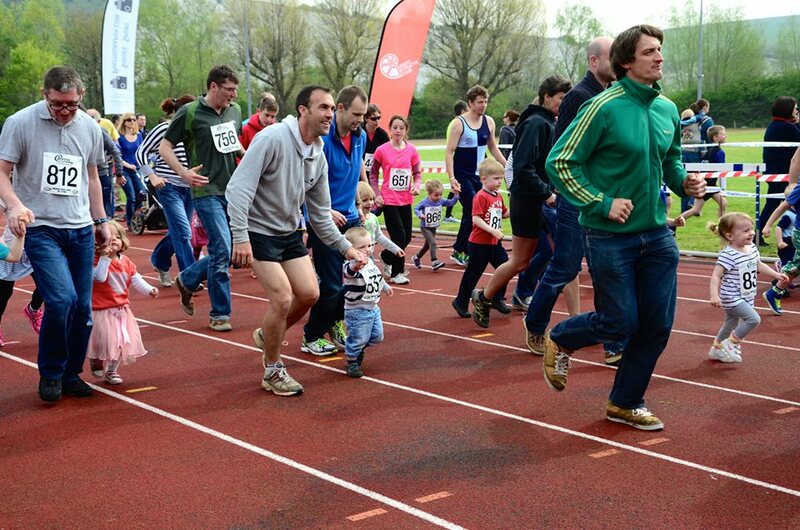 There are 3 events for children and then the 10k for the adults, so it’s a real family affair. 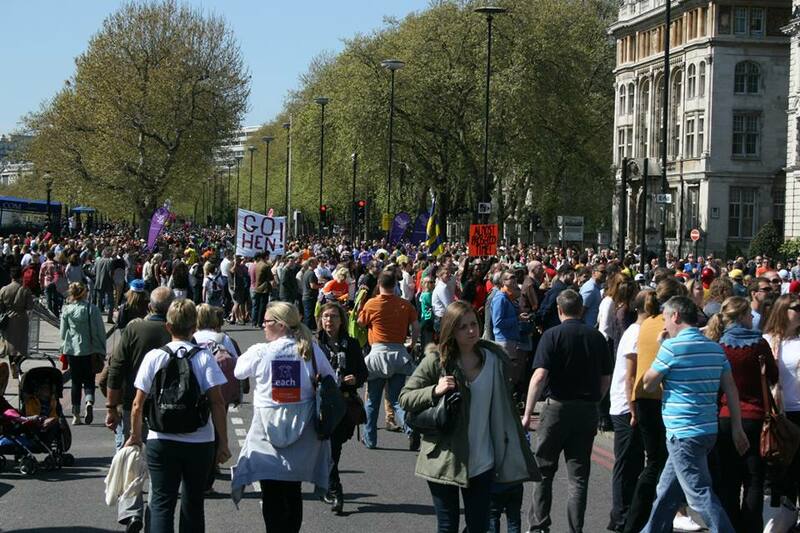 And to say that BHR were out in force is an understatement and this was not all of us. The 10k race starts with half a lap of the track, followed by 1.5km on tarmac, then it’s off road for about the next 6.5km. The off road section is mainly track, which is good to run on. The only difficult section is uphill across a field at around 6km and a field which is always boggy straight afterwards. There are also a couple of bottlenecks, so you will lose upto a minute at these sections. This is one of the reasons not to expect a PB on this course. The organisation and the atmosphere at this event are excellent, although there seems to have been an issue with the results this year. 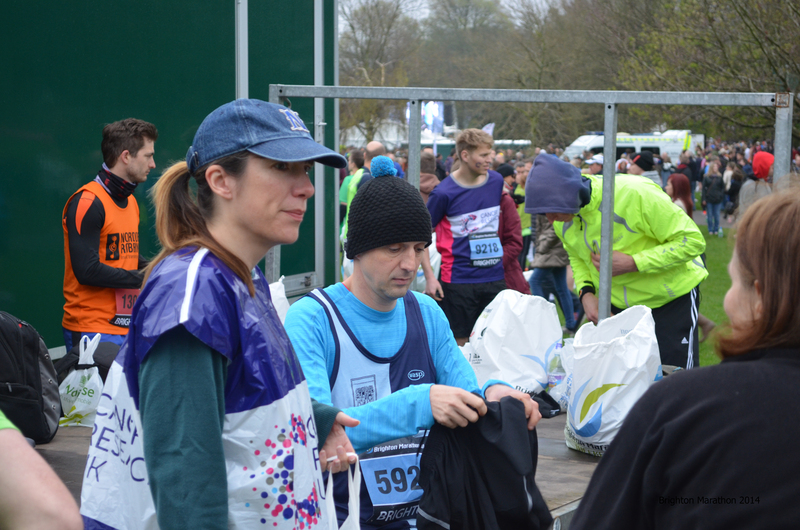 This was the first race that I ran with BHR almost exacly 3 years ago and is always a very pleasant way to spend Easter Monday. This is what I did this weekend. My body is telling me that it was great fun, incredibly rewarding and very tiring. 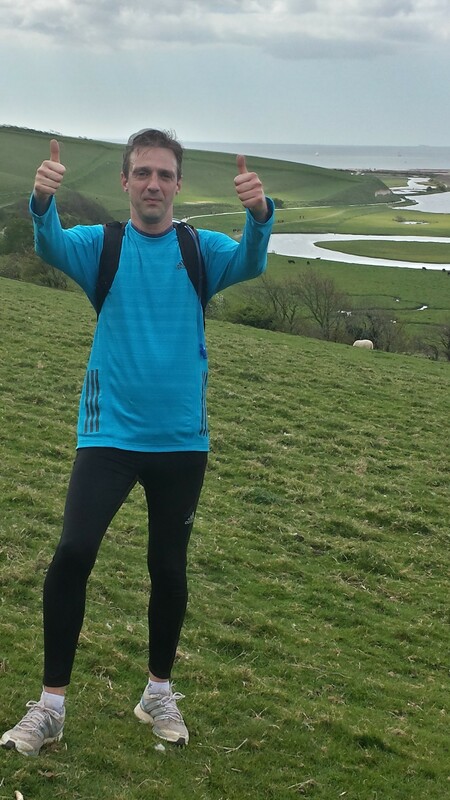 In order, marshalling at Clair pakrun, 14 miles along the South Downs Way, then lots of clapping, cheering and laughing at the London Marathon. I was tucked away at the top of the downhill section to marshal on Saturday at parkrun. It’s a really good spot as you see people before they head off down the hill, although there is a spell for a few minutes when you don’t see anyone until the quick boys come past on the second lap. 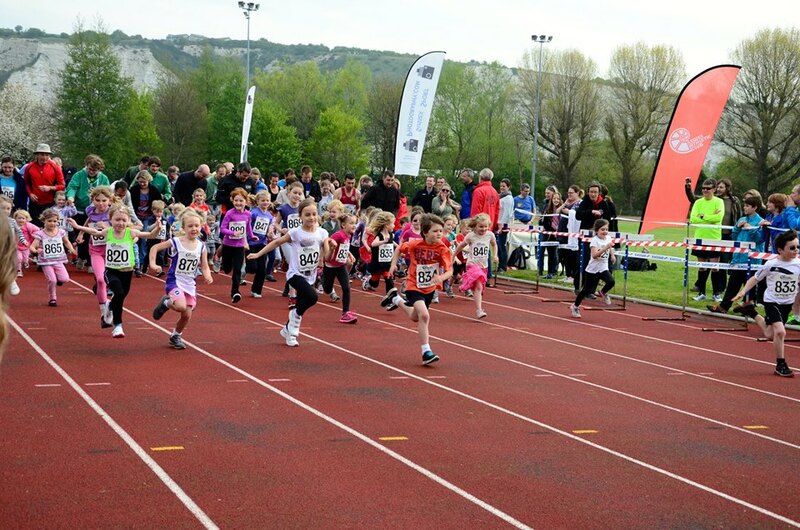 On Saturday, it was great to announce the parkrunner of the month for March. 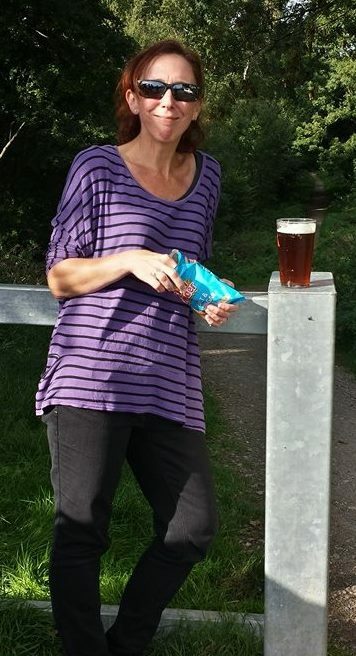 The winner, Sue, was there on day one and typifies what parkrun means to us. She comes down with her family, friends and neighbours and is always smiling. She’s getting quicker as well and removed a huge chunk from her PB on pacer day. I am currently in that bizarre space between recovering from one marathon and preparing for the next one. It is 3 weeks until 3 Forts. I’m not really sure what to do. 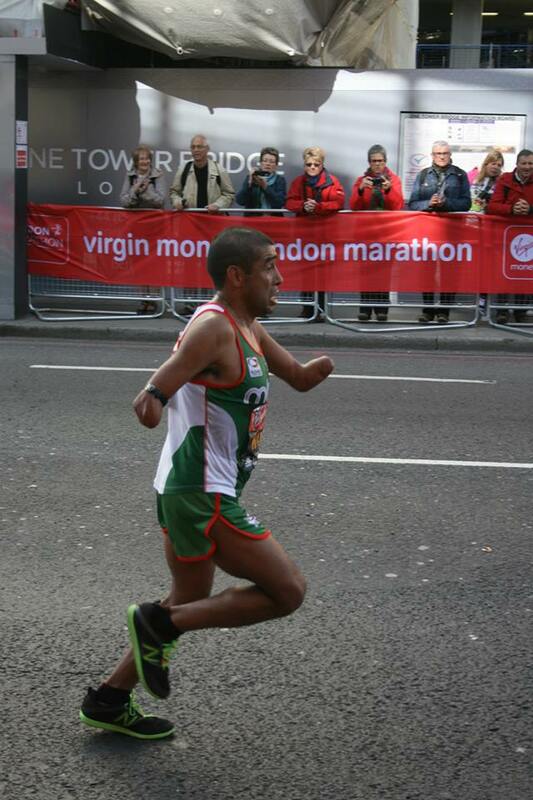 I’ve never been in this position before with 2 marathons in quick succession. I don’t really know what to do, but I think that my legs told me on Saturday. Jay and I took the train over to Shoreham and ran home. 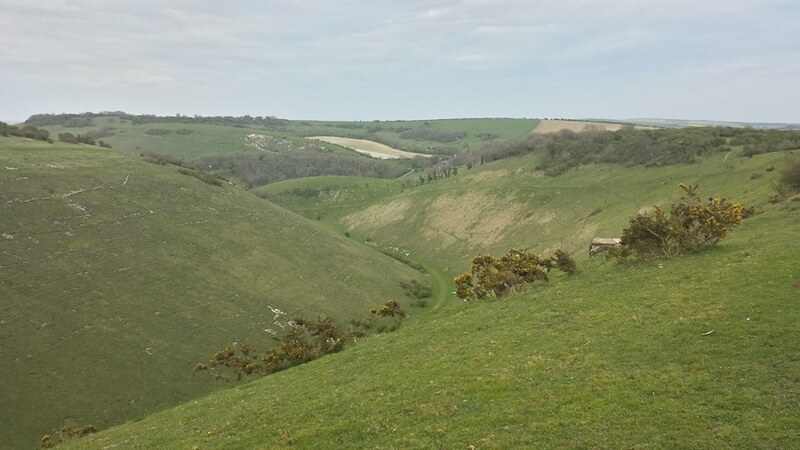 This takes in part of the 3 Forts course and I really love this part of the South Downs. I know it very well from my cycling days. As well happen at the 3 Forts, we walked up the hills and ran the flat and downhill. It was a bit of a struggle to get over Newtimber and the downhill sections are pretty steep, which is not the best way for my knees to spend the afternoon. We did, however, make it back home in just over 2 and a half hours, which is the pace that I am going to be aiming for at 3 Forts. 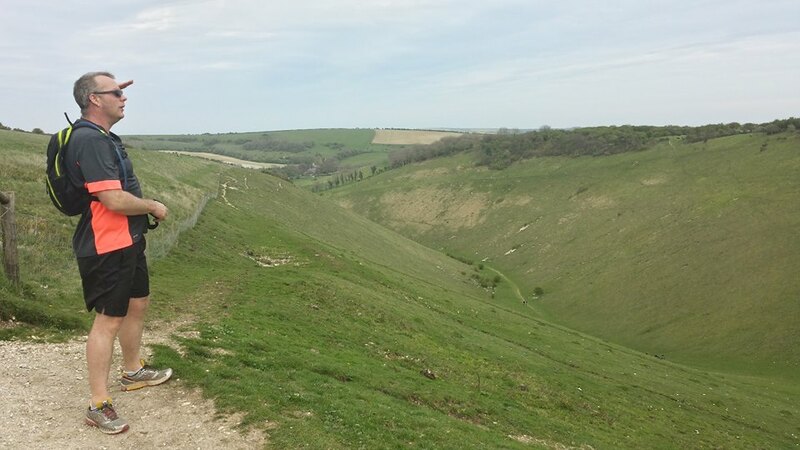 It’s pretty easy to see from these photos why it is so great to make the effort to get up onto the South Downs Way. 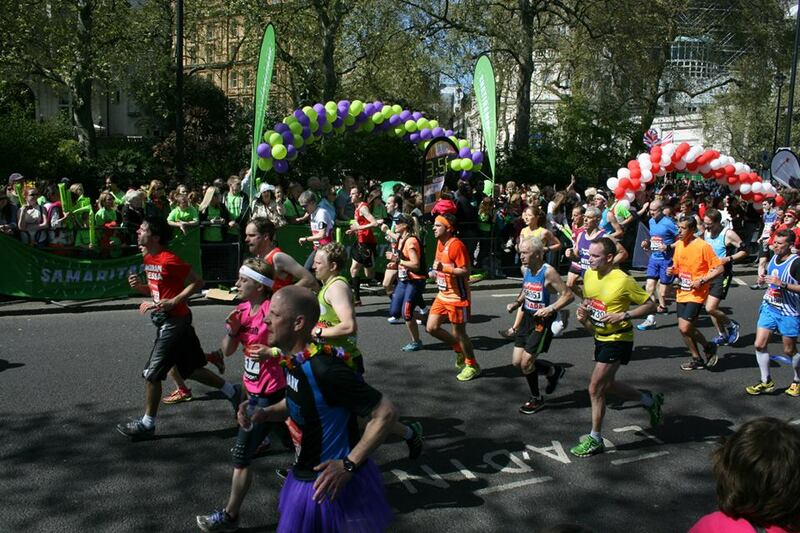 Sunday was London Marathon day. 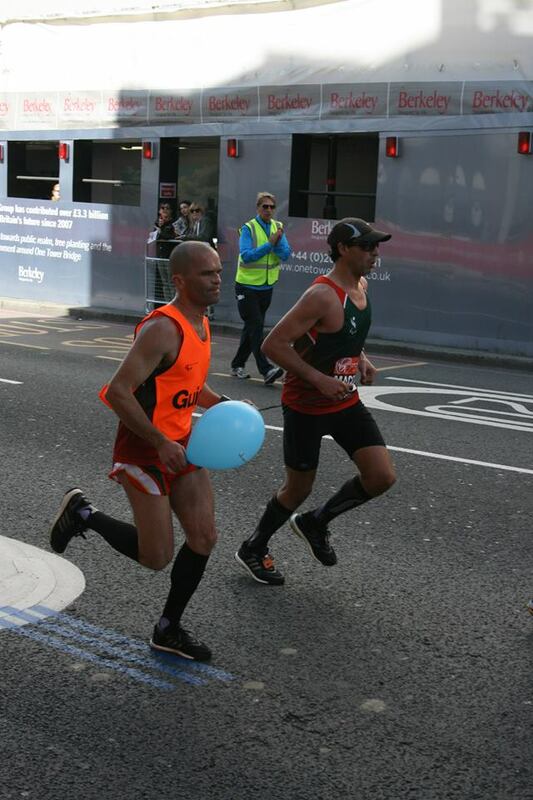 I was more excited about supporting in London, than running in Brighton. A lot more relaxed as well. We got a really early train up and there were still lots of spaces at the barriers a couple of hundred metres from Tower Bridge. Perfect. 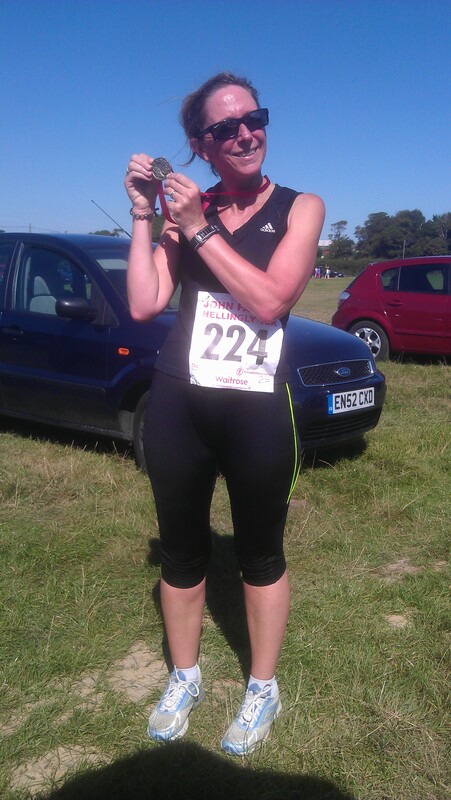 And the parkrun meagephone even had a day out. The first athletes who came through were the para-athletes. It was pretty awesome to see these people. Partially sighted or blind runners with their guides and amputees all went through. It’s quite humbling and amazing to see how people overcome adversity. 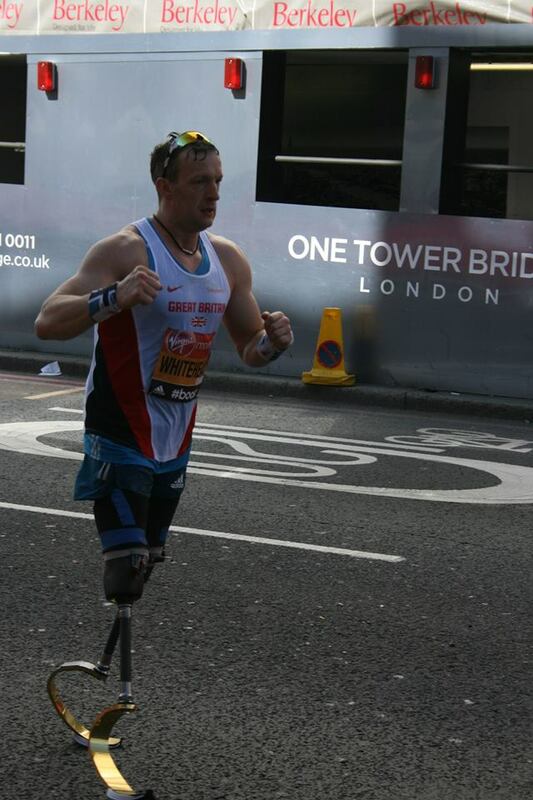 Finally, we saw Richard Whitehead. This chap touched the hearts of many people during the Olympics and the place went crazy as he ran past. It must have been such a buzz for him, as I imagine that was the reception he got most of the way round. 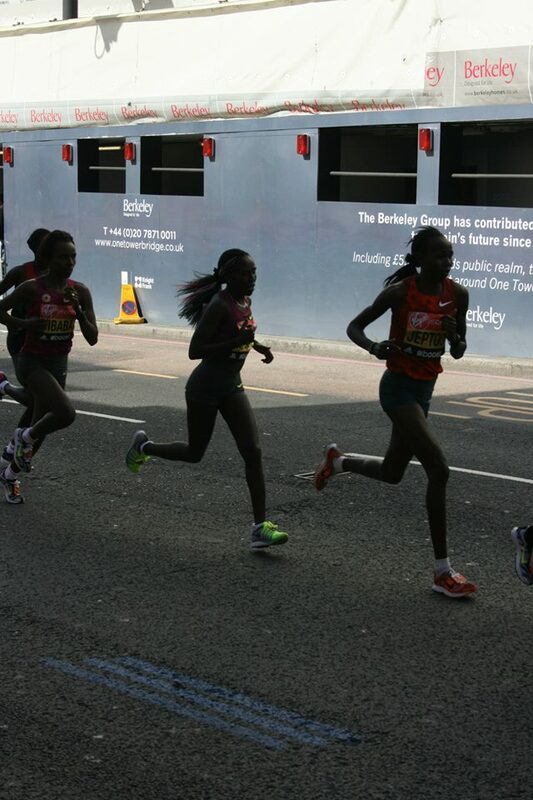 The ladies soon came through at a fair rate of knots, followed closely behind by the men, including Mr Farah..
And then came the very impressive club runners and the masses. 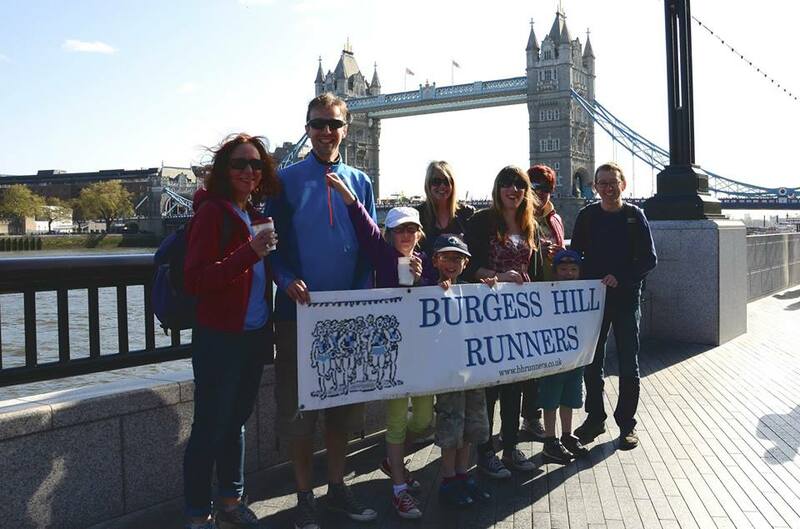 We watched all of our club runners come through and then headed off on the long walk over Tower Bridge, along the river to mile 25 miles. It’s a long walk, but worth it. 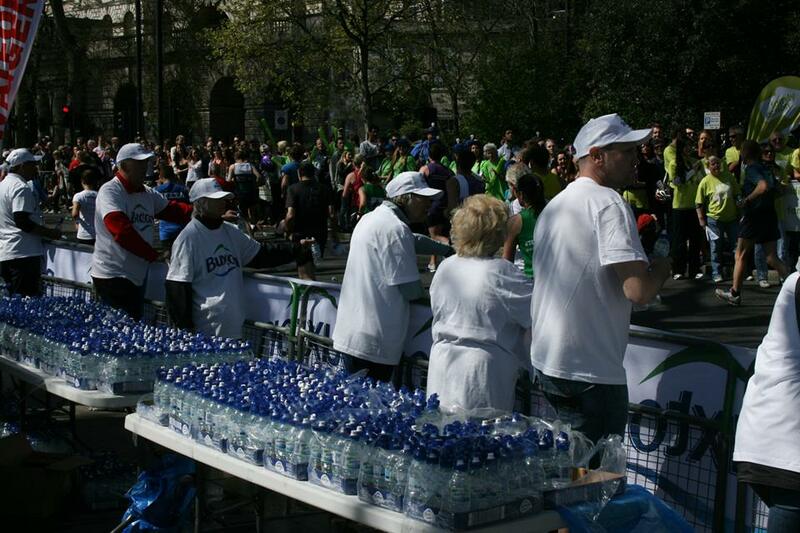 It was still possible to get to the barriers to cheer people on. 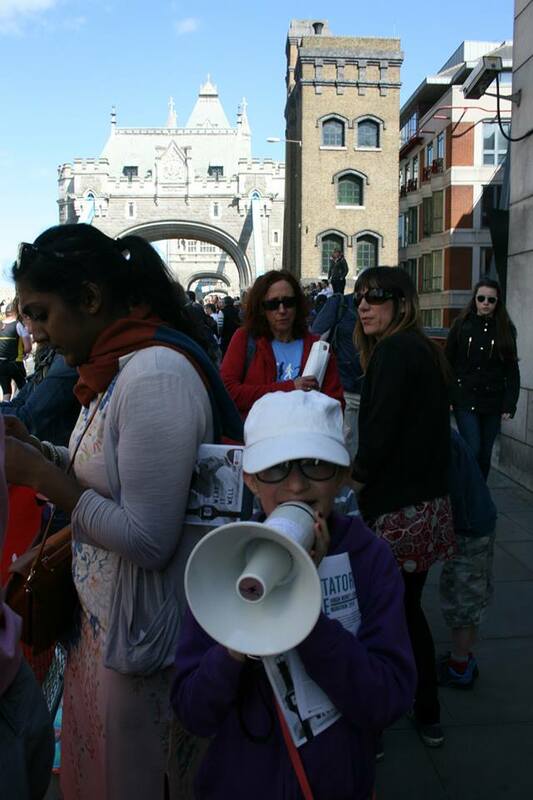 The noise on the Embankment was at a different level. 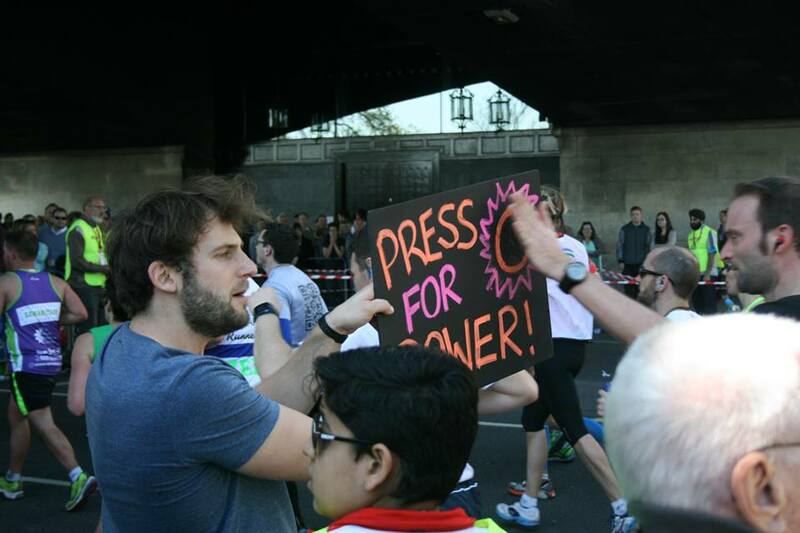 It was the cheering point for many of the charities and the volume increased each time a specific charity’s runner went past. This is where people need the help and they got it. If ever there was any doubt in my mind about getting up very early on a Sunday morning, when I could have done with staying in bed, then I think that these photos prove that going to London was the best idea I have had for some time. 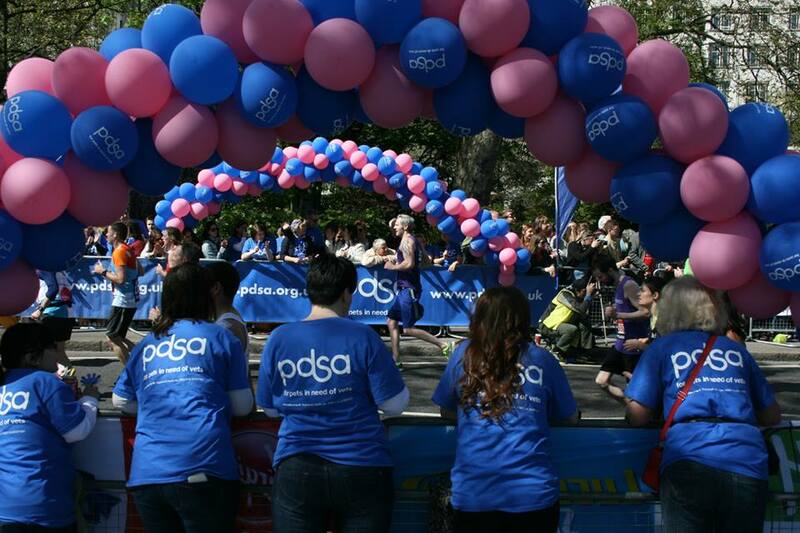 Well done to everyone for doing this, runners and supporters. Well done all those BHR people who reached some amazing personal goals. The most incredible performance came from Helen Pratt. 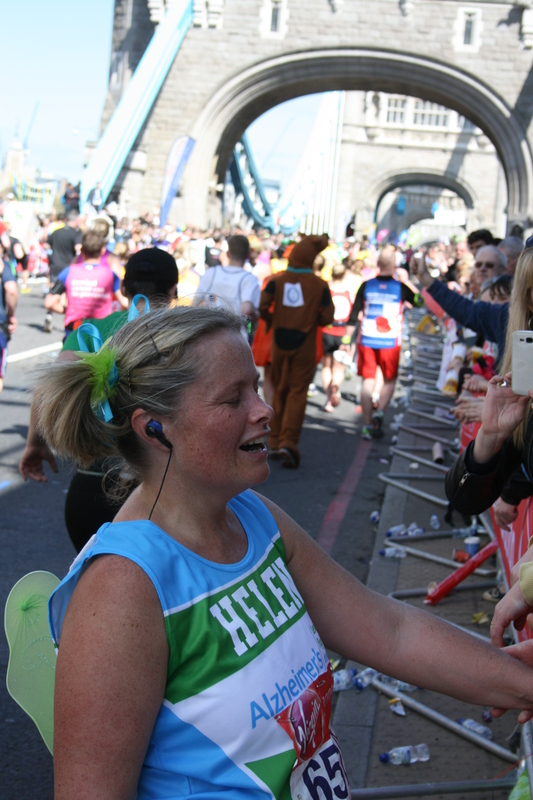 2 marathons in 2 weeks and the smile on her face on Sunday was just amazing. So, it was time for a quick beer at the lovely Blackfriars Station before heading home after the most incredibly rewarding and tiring weekend for some time. 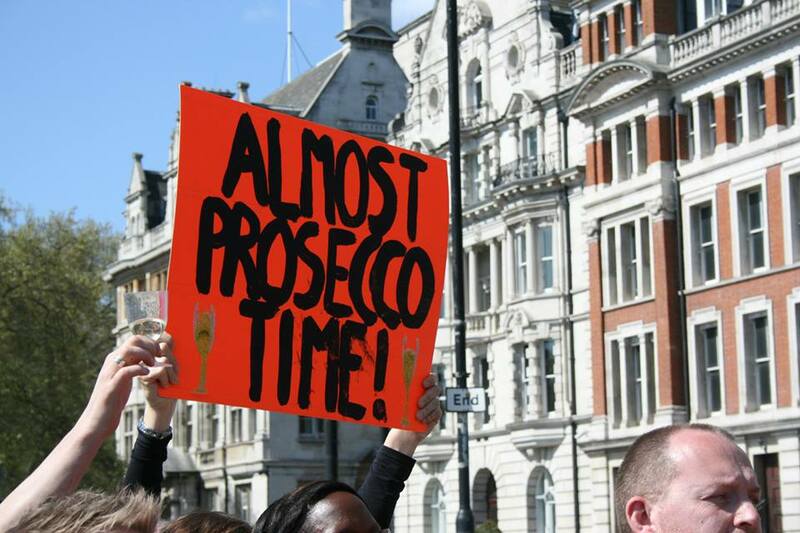 This was the message on one of the signs that was out of the course on the Brighton Marathon. How could you not be inspired by that? 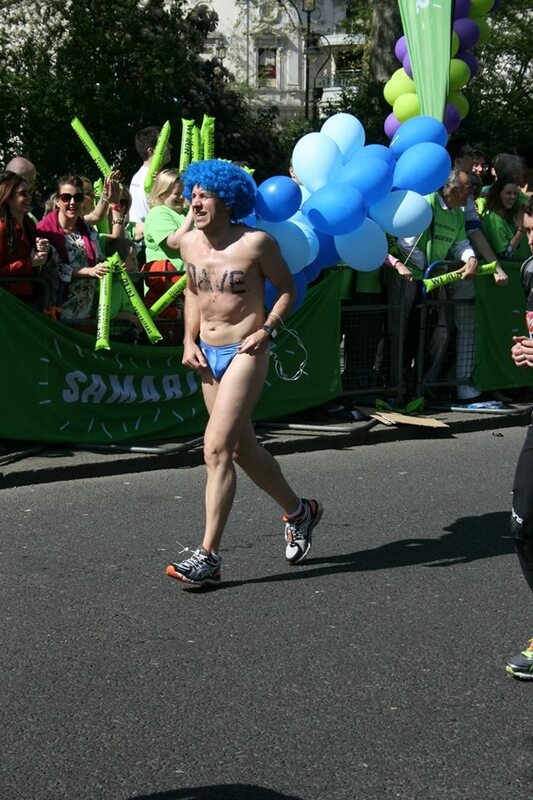 The Brighton Marathon was special on many levels. The atmosphere was amazing. 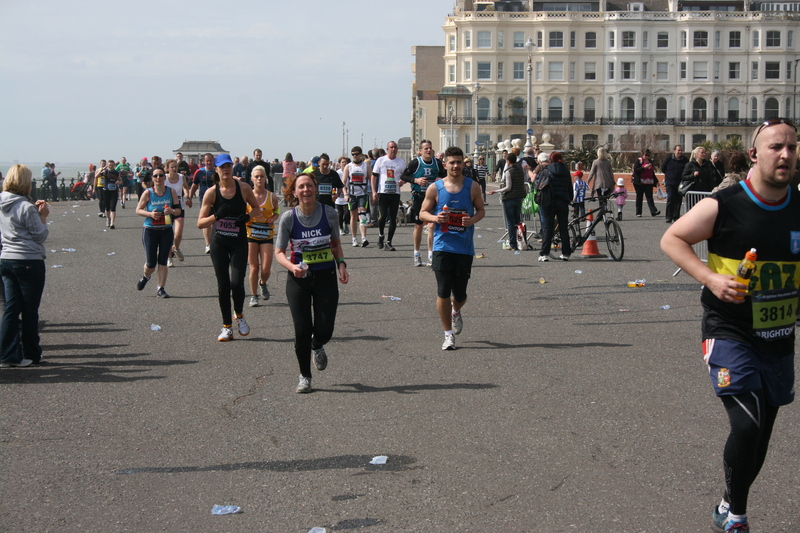 The crowds came out in their thousands and I got to run a marathon around my adopted city and along the seafront that I have trained on hundreds of times. 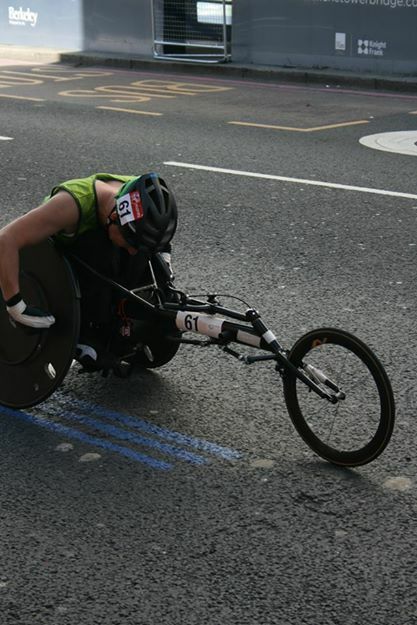 This race was my first flat marathon since I joined a running club and started to recieve advice from coaches and experienced distance runners. 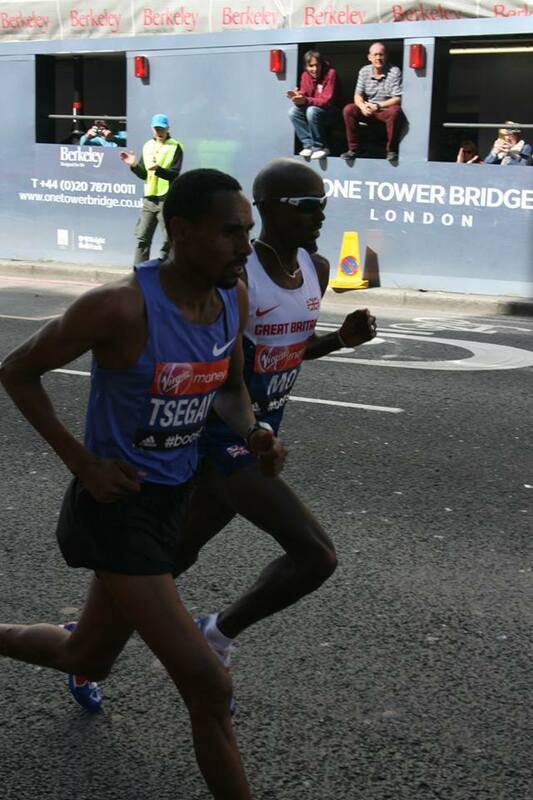 In my 3 London marathons I made huge mistakes in the training, preparations and on race day. I had a plan for the race that I was determined not to mess up. I wanted to run the first half in 2 hours 6 minutes and then speed up slightly in the second half. This is a kilometre every 6 minutes. Most importantly, I wanted to enjoy the second half and not hate it like I have in previous races where I have run the first half too quickly. I struggle to sleep the night before a big event. I even get up 3 hours before parkrun each Saturday, as I’m so excited. Surprisingly I slept through until 5.30am on Sunday morning and was only woken up by the sound of one of the cats wrestling with a fur ball. Great timing Ozy. So the promised rain didn’t arrive (apart from the 10 minutes before we set off in Preston Park). This was so good, as we waited for ages to get out of the station and were in Preston Park for some time before the race was due to begin. So we crossed the start line. 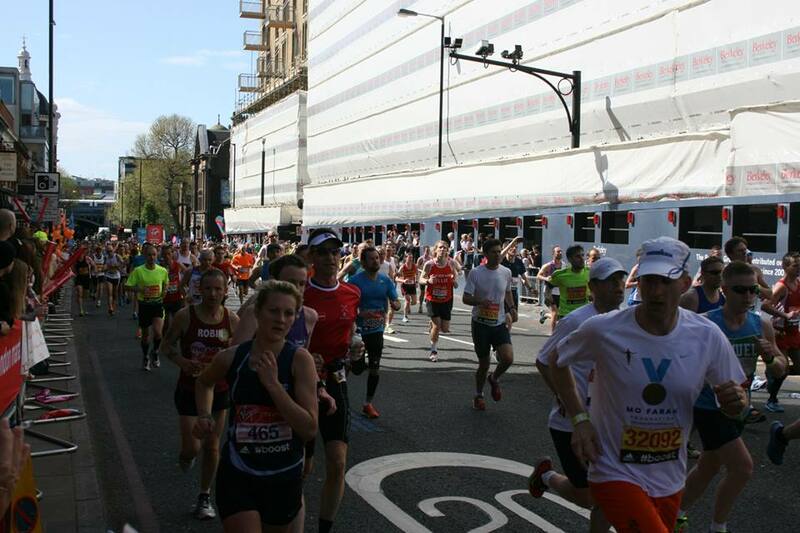 I shouted a greeting at Paula Radcliffe and off we went. Slowly. The first 10 minutes of the race were pedestrian. Lots of stride chopping as people stopped to hug friends and chat. I soon found my target speed and settled into a rhythm. The first half of the race flew by. The section through the city centre was very well supported, as expected. 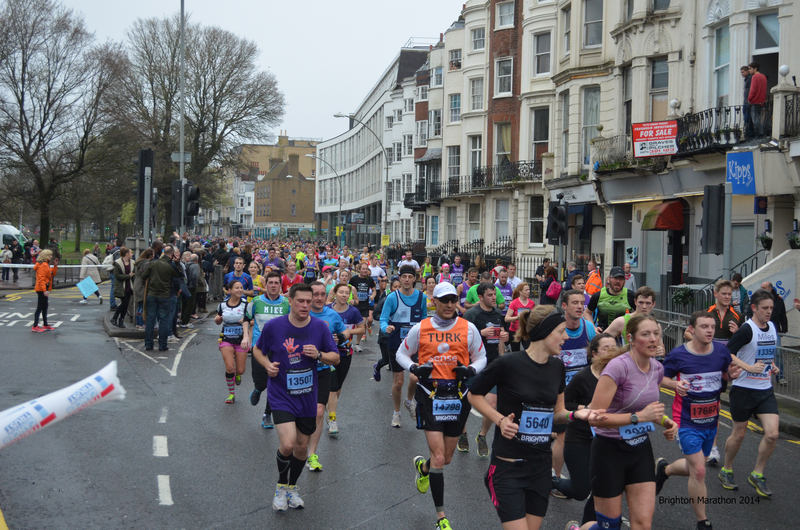 However, I wasn’t expecting the crowds on Lewes Road at around 7km. This was where the first turn round point was. Some people are not fans of these. I am. I love cheering on people that I know (and some I don’t) who are running in the opposite direction. There are 4 such double back sections on the course. At kilometre 9 you climb through Kemptown then down onto the seafront to head east towards Ovingdean. For the most part of this section, about 10km in total, you can see runners on the other side of the road heading in the opposite direction. 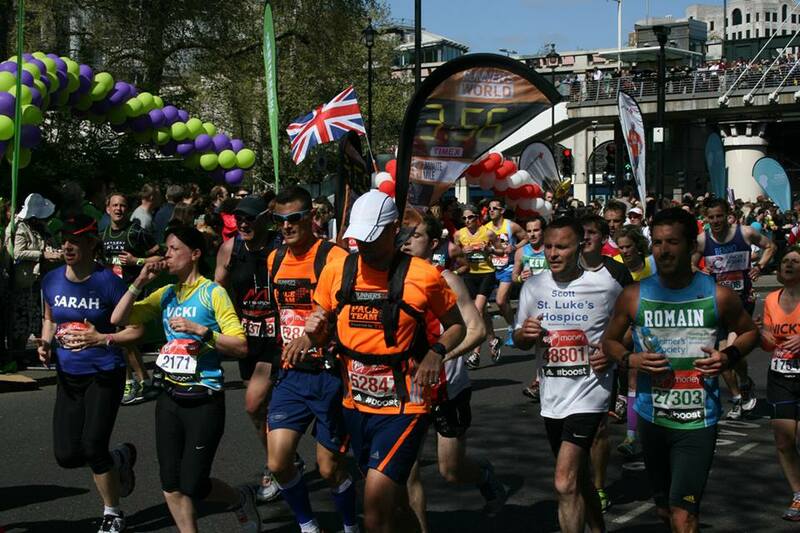 It inspires me to see the fast runners, especially if they are wearing a vest I recognise. 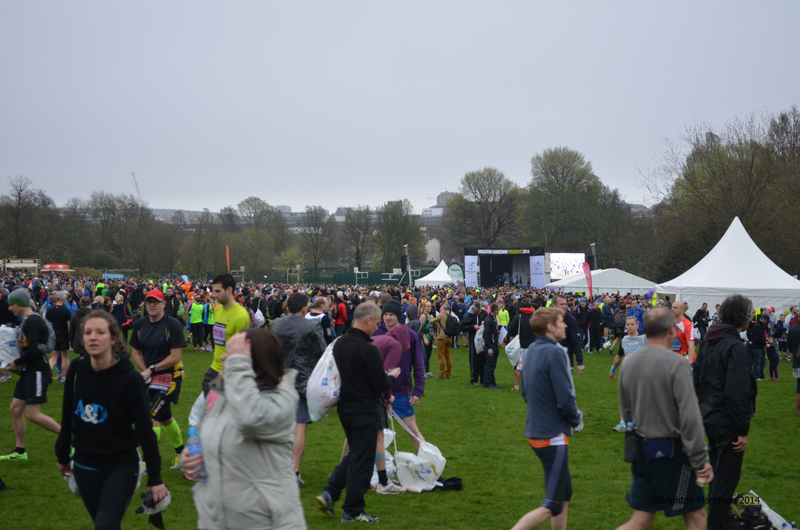 So, as you head back into the city centre towards the half way mark, the crowds build again. It’s all pretty noisey. At half way it was a breeze, I’d done what I set out to do. I’d planned to get to half way in 2 hours 6 minutes and I got there just a minute under that. The reason for sticking to this plan was some very sage advice from several people over the past few months. 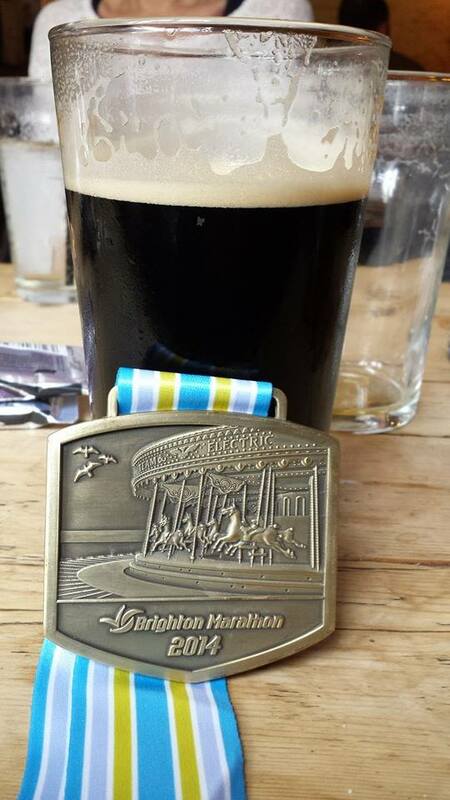 It was cemented a few weeks ago when a couple of parkrunners and experienced marathon runners told me that a marathon really starts at mile 20, so I’d best not be knackered when I got there. So the next stage was Church Road and New Church Road through Hove and out to Portslade and back. Several people had said that they hated this section as it was dull. There were so many people out of the side of the road, people having food and playing music. One sign said ‘Well Done, Random Stranger’. Says it all really. It was fantastic and the atmosphere was superb. The people of Hove really came out in force. At kilometre 30 you hit the seafront again, heading west towards the ‘dreaded’ Shoreham Power Station. A lot of people hate this section, as you are heading away from the finish and in previous years it has not been well supported in this area. Again, there were people all along the route. At the end of Hove Lagoon the crowds got thicker and the music louder. At the power station the crowds were amazing, deeper and more vocal. So many people calling out your name. So many that I even missed people I knew. After the power station you hit the home stretch at kilometre 37. That’s 5km to go. That’s a parkrun. I kept saying to myself, it’s only a parkrun. It may seem that the Palace Pier is a long way in the distance, but it’s only a parkrun away. And it’s a flat one. And there’s a shed load of people cheering you on. 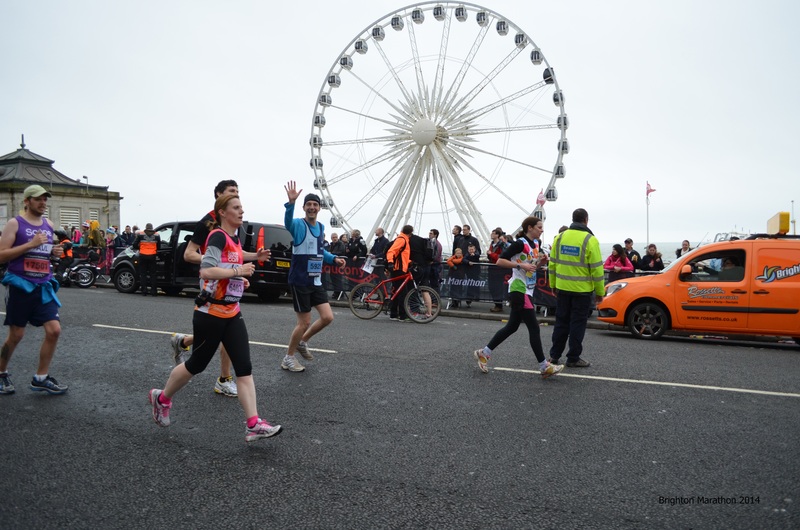 I was expecting the crowds on the coast road at the finish, but I was not expecting what met us on the Hove prom. The spectators seemed to form a funnel and the noise was really intense. 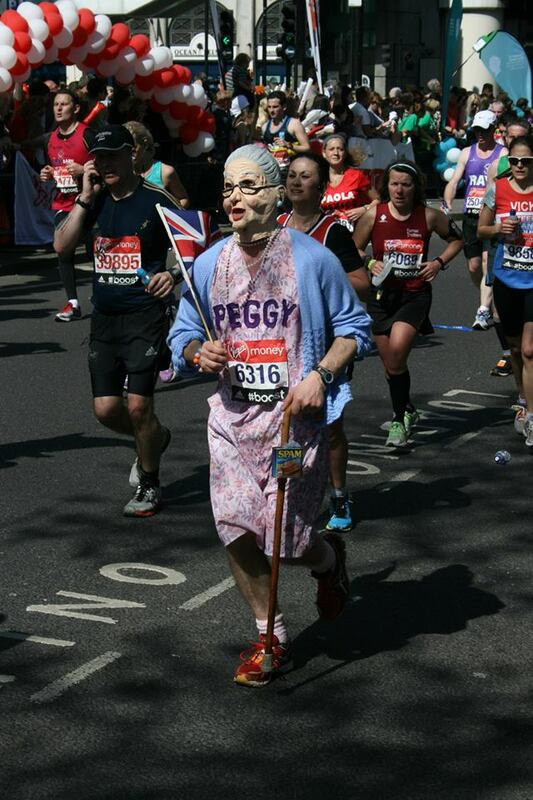 Due to the fact that I’d hit the pacing as planned, I was still strong and overtaking lots of people at this stage does the confidence a world of good. As expected, the short incline at the Peace Statue felt like a small mountain, but after that, it was all downhill to the finish. I speeded up and cheered myself down the last section, punching the air and loving every second. I’d done it. I’d done exactly what I’d planned. 4 hours 9 minutes and 12 seconds is around 11 minutes off my previous best. That’s a negative split by 26 seconds for the second half marathon. Even as a plodder, it’s important to plan well and carry out that plan. I’m so pleased with myself. I may sound excessively happy, but this is just the pride in the achievement. Marathon number 3 done in 2014. All 3 have been very different. I must admit that this one made me pretty emotional at times. 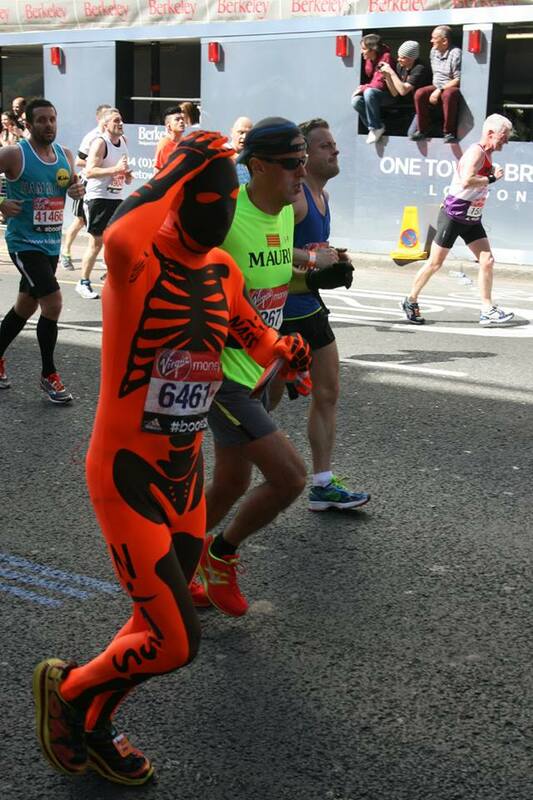 I passed a guy at 17 miles who had a message written on his back saying ‘this one’s for you Dad’. He made me cry. I haven’t gone through anything to warrant wearing a t-shirt like that and I hope it’s a long while until I do. It also got a bit emotional as I sat down to recover in the finishing area. I’ve come a long way in the last 2 years. I haven’t felt this well for some time and the focus of these events has played a major role in that. No time to sit around recovering from this event though. 3 Forts Challenge in 4 weeks. 27 hilly miles here we come. Then it’s the Green Belt Relay. And then, who knows? 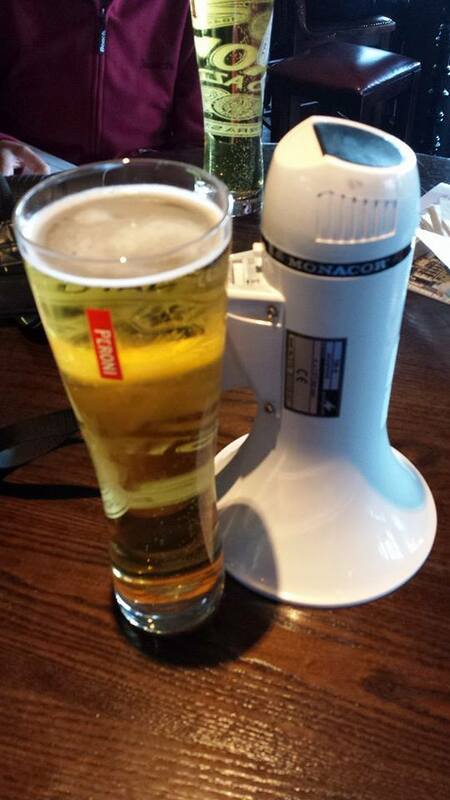 In the meantime, a nice pint of beer and relax. Photos courtesy of Jon Lavis and Caz Wadey. Thank you as always.